Did you know the hair on your avatar’s head or the prim clothing on avatars in your classroom could be causing most of your lag in Second Life. But you can get rid of some of it. A real life representation of lag. The Lindens have recently come up with a fascinating tool which allows you to see how much personal lag you cause and others cause: it was interesting to use the tool and see that one so-called self-appointed welcome area lag protector was causing the most lag in the region he was in – with 9000 plus prims he had a magnificently dressed and coiffed avatar but he contributed more to the problem rather than the solution. A recent issue of the Second Life blog tells you how to look at your avatar’s lag footprint and those of others and if you are into green SL stability how to lower your lagginess – which should help everyone survive in SL. It means low prim hair, low prim clothes and attachments and no more bling. The blog provides a primer on computer graphics and video games and graphics pipeline stalls as well as advising how to avoid them. 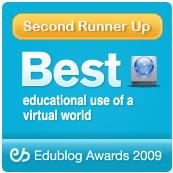 RezEd, an online hub providing education practitioners using virtual worlds with access to resources and research in the field of learning has now gone live BETA (www.rezed.org). Described as being designed to establish a strong network for those using virtual worlds for learning, the community will feature inter-related podcasts, brief best practices, digital resources, and featured blog posts and discussions.